Two or more people play BtC with two reference cards, dice, and about 350 counters on a 22" x 34" map where each hex spans about 70 nautical miles (80 land miles) and each turn represents one day of real time. Players alternate manoeuvring air, ground and naval units for up to 14 nations to resolve battles with a universal "strike" mechanism that applies across all types of combat; missile defence capabilities are central to survival. Air units represent from 30-90 aircraft each, most ground units are regiments, and naval units are small groups of surface ships/submarines or individual aircraft carriers. Specialized chit play simulates black ops, cyber warfare and various political developments. BtC is solitaire friendly. 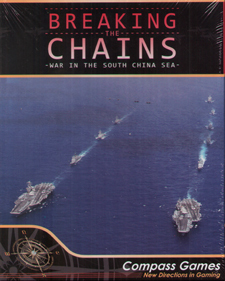 The naval operations which dominate play are based on a roll-to-evade model rather than search-to-find model. That means, owing to a battle space awash in electromagnetic emissions, enemy positions - except for motionless submarines - are assumed to be known unless a last-minute dice roll determines a potential target has evaded detection. So there is no hidden movement to stifle solitaire play; and the hidden placement of submarines can be forgone. Finally, the special chits that govern black ops can be played at random to further enable solo game play.